Does your existing HCS Cat5e / Cat6 data netwerk support modern WiFi Access Points? Two years ago the IEEE 802.11ac WiFi (Wave2) was introduced by the IEEE WiFi Alliance. This WiFi standard reaches a theoretical speed from 433 Mbit/s up to 6,77 Gbit/s. To support this hi-speed WiFi the IEEE 802.3bz working group specified 2,5Gbps over 100m of Cat5e cabling and 5 Gbps over 100m of Cat6 cabling. According to the HCS quality guidelines, the HCS premises network cable is produced with an extra margin of min. 3dB headroom (ACR) with regards to the requirements of the international standards. This extra margin contributes to be able to apply new protocols on your existing HCS premises network. If you have chosen to install a certified Shielded/Foiled HCS Cat5e or Cat6 premises network in the past, HCS warrants this network to comply with the latest 2,5 GBASE-T standards with regards to Cat5e and respectively 5 GBASE-T standards with regards to Cat6. In case your current HCS certified network is based upon a Cat5e or Cat6 Unshielded Twisted Pair concept, this network will fulfil the requirements of 2,5 and 5 GBASE-T, supporting the NBASE-T cards. In case of a UTP network additional Alien Cross Talk (ANEXT) tests are required to make sure the network complies to the 2,5 and 5 GBASE-T standards. The ISO/IEC TR 11801-9904 and the TIA TSB-5021 standards were introduced to address the evaluation of existing Category 5e and 6 cabling for support of these applications. 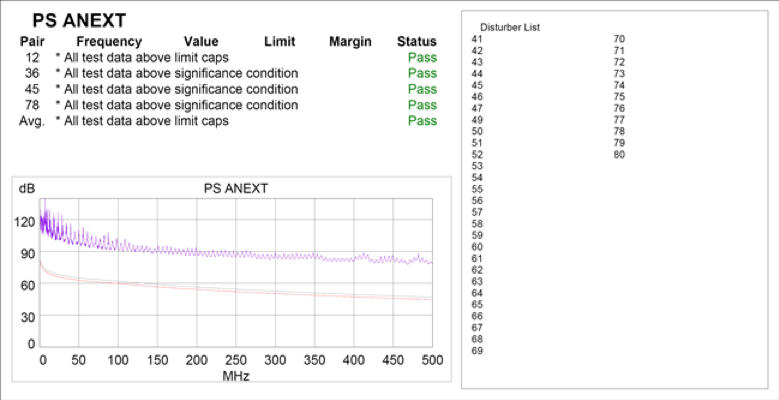 These documents describe qualification specifications, including premises network parameters (wire map, Insertion Loss, NEXT, Return Loss) but also Alien Crosstalk qualification specifications, find below table Example of PS ANEXT test. In case both above mentioned tests results are assessed with a “Pass’ your network fulfils to the 2,5 GBASE-T or to the 5 GBASE-T requirements. The IEEE 802.3bz standard also provides support for PoE+, as several versions of WiFi Access Points require power over the premises network. If installed according to the International standards and in case environmental conditions are within the required limits the network will operate properly in case PoE+ is applied. In case you would like to investigate if your network is suitable for the latest WiFi-applications, please contact LGCE as our certified installation partners are able to perform the required tests.